Save Money Buying A HouseEliminate The Muda! With the recently extended tax credit for new buyers of $8,500 and a newly added $6,500 tax credit for move-up or repeat buyers there is certainly an incentive to act now on the purchase of real estate. Based on historical records now may very well be a great time to buy. While prices are low and the credits are available, the purchase of real estate can still be a very expensive proposition, outside of the cost of the real estate itself! By my count there are as many as 59 different fees that you may incur when buying a house. These come from a variety of sources including your mortgage broker, mortgage company, attorney, title company or real estate agent as well as a number of other service providers that may be required by law. There have only been 3 homes that I have purchased. The first house I purchased before I was 20. It was the mid 80’s; the mortgage rate was about 11.5%. I never even tried to negotiate and paid full price as a result. Then, I about died when I saw a truth in lending statement for the first time at closing. I recall the house being less than $85,000 but the interest exceeded $200,000! Only then did I learn how much a small interest rate can add up to over 30 years. My second purchase was not made with much more intelligence. A fixer upper in the Inland Empire of California that I got lucky with, selling just as the market was beginning to collapse. With my third house I’d gained enough intelligence to negotiate hard on the price and terms for repairs and maintenance. On the interest rate I thought we could do better. My wife didn’t want to challenge the status quo. I simply asked for a better rate and it was magically provided. Until I saw the list of fees above I felt good about this purchase. Now I am compelled to dig up our paperwork to see how much I actually spent. Then again maybe I won’t! Through the house buying process you will be handed stacks of paper every step of the way. On the surface, a fee here and a charge there when spending a few hundred thousand dollars, doesn’t seem like much. Added up they become a small fortune. 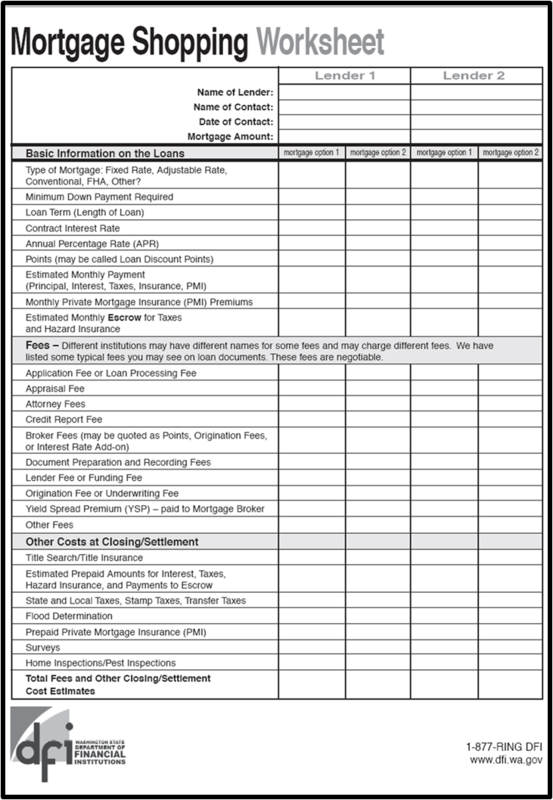 To help you in the process, print out a copy of the Mortgage Shopping Worksheet pictured above provided by the Washington State Department of Financial Institutions. Get estimates from several different lenders and ask for a detailed good faith estimate (GFE), this is a required document a lender must provide you within 3 days of applying for a loan. Fill out the worksheet and compare the various costs. Fees to third party vendors like title search providers and attorneys may not be easily negotiated but all other costs are open for discussion. Administrative fees like courier services, postage & handling, and filing fees should be discussed. There are also the ridiculous fees like application fees and underwriting fees that should be questioned intently. From personal experience I can say that it is difficult to consider walking away from such a large purchase over a $500 charge after so much time has been invested. By doing your homework upfront you can eliminate many of these potential deal breakers before you get to the closing table. Wow, that’s a scary list of fees! Good reminder for folks thinking about taking the plunge!